Planting seeds is the most basic act of farming. Taking an embryonic plant, casting it to the ground, or under the ground, and joining hands with God to create new life, is at the very core of what it means to be a farmer. I got to sow some seeds today. First, I threw out a couple of pounds of annual winter rye grass seeds on the bare patches in the pasture. The drought has done a number on our poor bermuda grasses that the sheep and alpacas graze on every day, thinning and strangling their growth. I'm hoping some fresh winter grass will help fill in the gaps and keep our topsoil from blowing away. I'm also hoping that this nice grass will save me from having to buy a couple more bales of hay this winter and spring. An unexpected gift fell from the sky this evening: a cold wind carrying some light rain, just as the sun was setting. Hopefully this will be enough moisture to wake up those seeds from their slumber, and into germination. The other seeds I got to sow today were seeds of knowledge and experience. 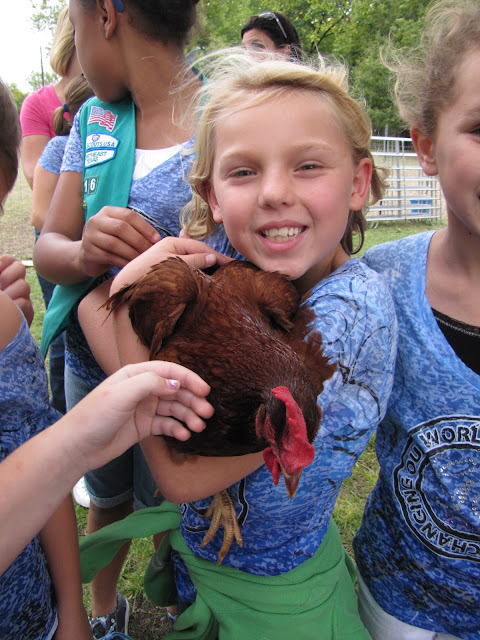 Twelve awesome Girl Scouts came by today to learn all about our farm animals, see them up close, and get a fuller understanding of the benefits and mechanics of fiber processing. Not many of the girls had ever touched a chicken, either. The hens were pronounced, "very soft." As usual, it's hard to determine who is more interested in whom, between the girls and the alpacas. They are both very curious groups of creatures. They gazed at each other with huge liquid eyes. I do appreciate that adventurous Girl Scout spirit that approaches a big orange Port-a-Potty with a no-nonsense practicality. This is much posher than hiding behind a tree, after all. Not a problem. They also feared no challenge from wool and spindle. The girls tackled their first spinning experience with lots of enthusiasm and a good deal of success. Check out their first plied yarns! Who knows if today's quick exposure to the world of Grow Your Own might have far-reaching influence? Are we looking at a fiber shepherd or two of the future? Or perhaps a knitter or weaver who appreciates where her materials come from? Vanni patiently received some scritches from his new gaggle of fans. A couple of the girls wanted to entice me with some money to buy him. Alas, I had to decline their generous offer. Vanni's staying with me. 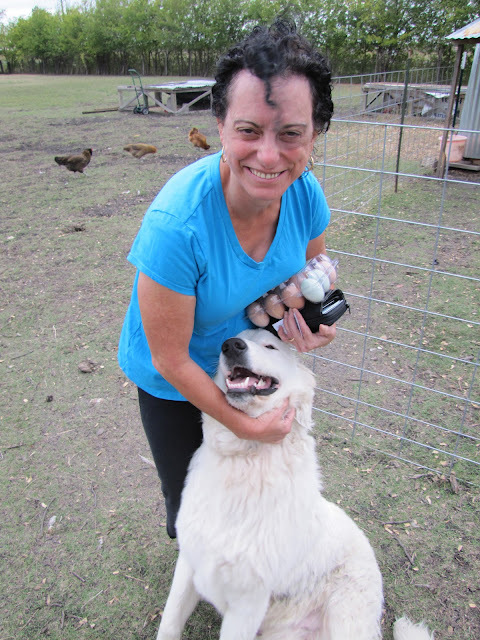 Who else would be there to lean on our sweet egg customers like Carol here? She had to be properly greeted and solicited for attention. Nobody competently handles this responsibility like the Vanster. After a long day spreading the Good News of the Farm, Vanni takes a well deserved chew-toy break. I'm delighted and content in my farmer skin tonight. There are new seeds on the earth waiting for just the right conditions to spring forth, and there are new friends of the farm who take home stories of bucolic joy. The seasons will change a little tonight, with a cold wind blowing autumn closer and closer. It's time to pull out the sweaters and scarves. You may be getting a call from Heather Clark about her GS group coming out for a visit. They are a bunch of girls from my school. I also talked to one of my 3rd grade teachers about a field trip. There are only 45 kids in the whole 3rd grade. They do a historical study in the spring and the farm is one of the things they may want to cover. Maybe they could do a virtual field trip. Hi Judith - that sounds great! Would love to have groups out from your school! Cindy, you are a great farmer, teacher, and photographer! That is a delightful photo of those darling girl scouts lined up looking at the alpacas and visa versa.